IITA staff present three new varieties (BRS Princesa, BRS Victoria, and BRS Pacovan ken) to Farmer Akekue for evaluation. Akekue is a subsistence farmer from Kpite Village in Tai local government area (LGA) of Rivers State who used traditional production methods. Luck, however, shone on him when he was selected in the 1980s to participate in the PBIP training at IITA Onne station. He was trained on improved methods of planting and was provided with improved varieties (SH 3436-9, Cooking Banana, and Km-5, etc.) for multiplication and distribution. He encountered setbacks as the new varieties provided by IITA were at first unacceptable to farmers who were skeptical to even try it; nevertheless, that did not stop him from multiplying these varieties; he observed all improved management practices he learned and engaged more farmers. “In the 1980s, farmers did not like the varieties but now they rush to get them because they bring more suckers, are resistant to Black Sigatoka and other pests, and have a fantastic taste. Unlike with the local varieties, if you plant 1000 suckers, you are not sure of getting 100 suckers from it because of pests and diseases,” says Akekue. 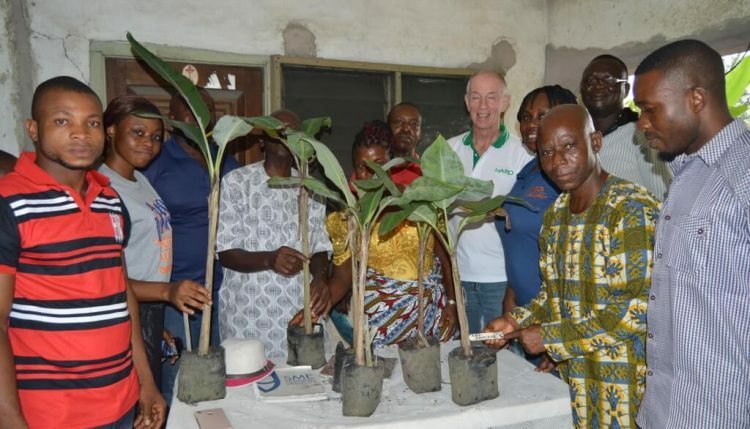 With IITA support, farmers began to see the yield difference between these IITA-introduced varieties and local varieties; the news spread like wildfire attracting both young and old farmers. Plantain and banana production became a money-making venture as the improved suckers were sought after by farmers throughout the state and in neighboring states. From the proceeds of his plantain and banana business, Akekue sent four of his sons to university; two are awaiting entrance into higher institutions. His sons are now professionals in the fields of medicine and surgery, engineering, and agricultural science. Currently, he is a consultant for seedling supply. Years ago he set up macropropagation chambers for different varieties of plantain and banana. He has supplied over 100,000 suckers to farmers, government and private agencies including the NDDC (Niger Delta Development Commission), and the IITA Youth Agripreneurs (IYA) in Onne station. “IITA improved technologies have helped farmers in this area to improve their farming methods and leave the traditional ways of farming, largely improving our livelihoods. We are grateful to IITA for the intervention and for making me what I am today,” Akekue said. Due to his passion to learn new ways of farming and adopt new technologies, the ever-hardworking farmer was engaged as an IITA contract farmer. 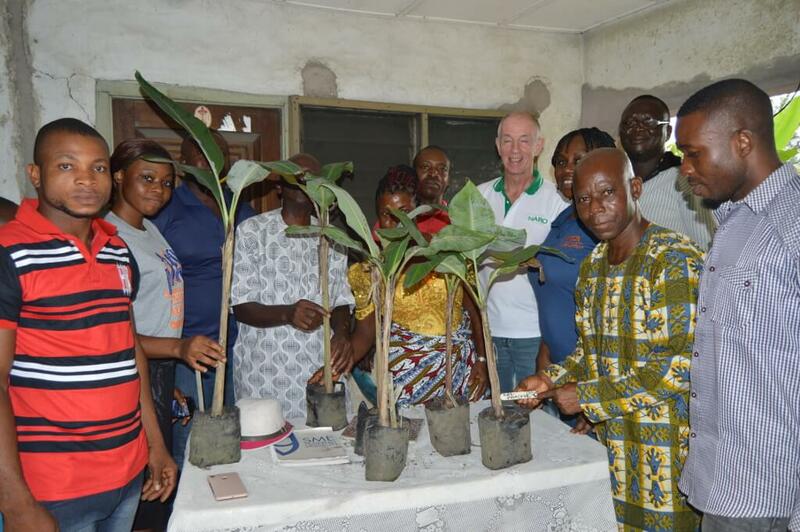 Rony Swennen (Senior Banana Breeder previously based at IITA Onne, 1979 till 1990) who was on a 3-day working visit to the station, together with Postdoctoral Fellow Josephine Agogbua, visited Akekue and commended him for being an active IITA Ambassador. Agogbua shared with him three new sweet banana varieties (BRS Princesa, BRS Victoria, and BRS Pacovan ken) developed in Brazil by EMBRAPA. He intends to grow these in his backyard for research evaluation and feedback purposes that will strengthen and validate documentation on hybrids. Akekue hopes to train more farmers and disseminate the knowledge gained to other regions of the country. “In as much as some farmers have adopted the improved methods, the majority are still plagued by the crude and ancient methods of production. Before one can adopt modern technologies, one must learn from an institution such as IITA which has the mandate to improve agriculture,” he concluded.